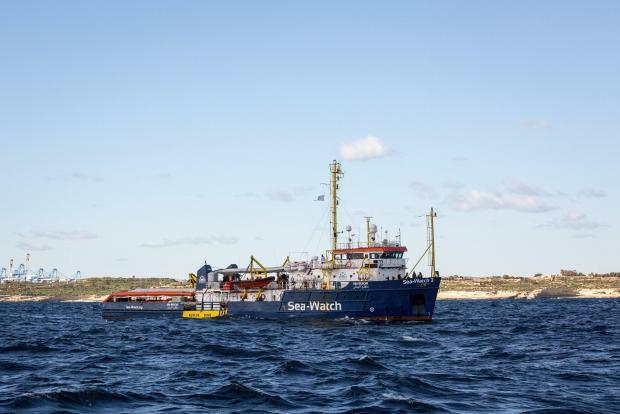 Prime Minister Joseph Muscat said on Sunday that he did not want to set a precedent by letting in a group of migrants stranded on board NGO rescue boats just off the coast of Malta. Speaking during a brief telephone interview on the Labour Party’s ONE radio, Dr Muscat said it would be the easiest thing to play the part of the “Christmas saint” and allow the group of migrants to disembark on the island, but this would open the island to becoming a Mediterranean disembarkation centre for refugees stuck at sea. The migrants were rescued off Libya by the MV Sea-Watch 3 and Sea Eye on and around December 22 but 49 people remain stranded on board, sheltering from rough weather just three miles off Malta, sparking diplomatic spats at EU level over who should assume responsibility for them. Meanwhile, Dr Muscat said he did want to set a precedent with the European community on what should happen in such scenarios. "We need to find a balance between the human aspect and the national security. This is an issue that might set a precedent and we should be vigilant about it. It is easy to play the Christmas Saint with everyone, but then come January, February and the summer period we would be told to do the same." He said that while others are making an issue with accepting 30 or 70 migrants and closing their ports, Malta has accepted to rescue 249 persons without protest. "If one would accept to disembark the two NGO vessels without making things clear from the outset, the bullies would have won, while the countries like Malta who respect the laws and save lives would end up being the victim, said the prime minister. “That is why we are stressing that we do not want this case to set a precedent. In fact, we are discussing with other countries and the European Union to tell us whose responsibility this case was and in case a similar case happens, who takes responsibility,” Dr Muscat said. He reiterated the government’s position that Malta would not be held responsible for those rescued outside its jurisdiction and competence. The Prime Minister also raised doubts about the rescue methods employed by the NGOs, saying he would not get into this issue on air as it would take too long. “There are many different opinions on the dynamics of these rescues and how they were conducted but I won’t get into that here,” he said. Earlier in the interview, Dr Muscat made glancing references to the year ahead, saying it would see revolutionary changes in a number of sectors. Sixteen-year-olds would be voting in local and European Parliamentary elections, and the government would be investing heavily in a number of sectors, from national security to recycling, he said. Meanwhile, Italian Interior Minister Matteo Salivini on Sunday again reiterated in a tweet that Italy would keep its ports closed to the migrant rescue ships. Italian ports are and will remain closed for those who do not respect the laws, he said. “L’Italia non è Salvinia” dicono quelli della ONG Sea Eye. Fate quello che volete, ma per chi non rispetta le leggi i porti Italiani sono e rimarranno chiusi.